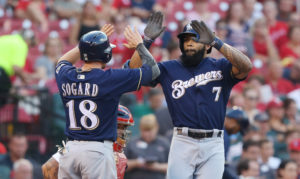 The Milwaukee Brewers jumped out to a 6-0 lead in the first two innings, then held off the St. Louis Cardinals 7-6 at Busch Stadium on Wednesday night. The two teams sat through a pair of rain delays that totaled 1 hour 50 minutes. Matt Garza was reinstated from the disabled list earlier in the day and was able to get through five innings for his third win. He was staked to a big early lead. Eric Thames two-run homer made it 2-0 in the first. Eric Sogard’s two-run double in the second made it 4-0, then Thames doubled in Sogard and Travis Shaw singled in Thames to make it 6-0. The Cardinals had an answer for Garza and the Brewers in the bottom of the second, scoring four runs. But Garza and Cardinals starter Mike Leake both settled down from there. Leake left after six innings, trailing 6-4. The Brewers added an insurance run in the 7th when Domingo Santana doubled and Hernan Perez singled to right with two outs to drive him in. The first delay came after 6 1/2 innings and lasted 50 minutes. The second came after a two-run home run by Aledmys Diaz, which made it 7-6. That delay would last an hour before Corey Knebel came on to record a four-out save. Knebel struck out Dexter Fowler to end the game, extending his streak of appearances with at least one strikeout to 34. The two teams wrap up the four game series at Busch Stadium tonight (6:15 p.m.). Zach Davies (7-3, 4.74) pitches for the Brewers. Michael Wacha (3-3, 4.50) goes for St. Louis.